Dogs sleep the most soundly if they receive plenty of physical and mental stimulation: so schedule in daily long walks and indulge your pooch in mentally challenging play. Don’t have sufficient time to help your dog burn energy? Then book a dog sitter, who can provide walks, playtime and belly-rubs! Sleep deprivation can occur if your dog isn't able to enter a deep sleep, perhaps due to overstimulation, or excessive noise and distraction at home. Incorporate plenty of rest periods throughout your doggo's day, and ensure that there is a cosy sleeping spot ready to go. Poor sleep can also have a physical cause, such as sleep apnea. This typically occurs in dogs with shorter snouts, such as bulldogs and pugs. 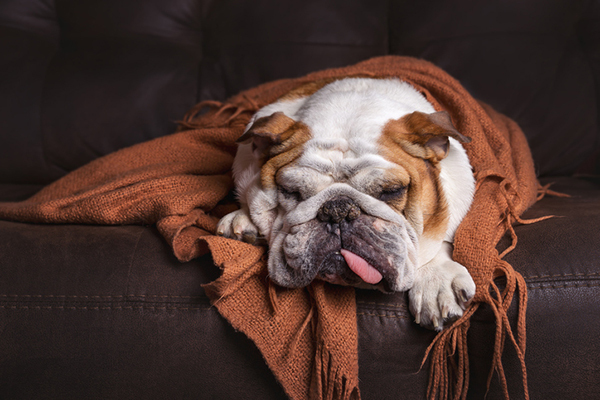 Have you noticed that your dog is sleeping less frequently and/or more restlessly than before? Then keep a close eye on their general health (daily activity, appetite, poop habits, coat health) and visit your vet if in any doubt at all. You’ve likely noticed your dog circling and pawing their bed before finally settling down to sleep. This is simply the equivalent of shaking the duvet and fluffing up the cushions in preparation for the perfect slumber. So, let your dog get comfortable and cosy so they can catch those well-earned zzzzzzzs.